Lama Surya Das, the most highly trained American lama in the Tibetan tradition, presents the definitive book on Western Buddhism for the modern-day spiritual seeker.The radical and compelling message of Buddhism tells us that each of us has the wisdom, awareness, love, and power of the Buddha within; yet most of us are too often like sleeping Buddhas. 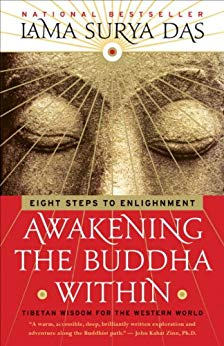 In Awakening the Buddha Within, Surya Das shows how we can awaken to who we really are in order to lead a more compassionate, enlightened, and balanced life. It illuminates the guidelines and key principles embodied in the noble Eight-Fold Path and the traditional Three Enlightenment Trainings common to all schools of Buddhism:Wisdom Training: Developing clear vision, insight, and inner understanding -- seeing reality and ourselves as we really are.Ethics Training: Cultivating virtue, self-discipline, and compassion in what we say and do.Meditation Training: Practicing mindfulness, concentration, and awareness of the present moment.With lively stories, meditations, and spiritual practices, Awakening the Buddha Within is an invaluable text for the novice and experienced student of Buddhism alike.From the Trade Paperback edition.